Place of clear aquamarine waters and white sand beaches, wetlands, eland and zebra, flamingos and pelicans, whales and dolphins. In Spring, the area bursts into a splash of colour as wildflowers bloom. For outdoor enthusiasts there’s hiking, mountain biking and swimming. Find out more in West Coast National Park: the ultimate guide. The West Coast National Park lies just over 100km northwest of Cape Town in South Africa’s Western Cape. It stretches from the seaside village of Yzerfontein in the south to Langebaan in the north and from the Atlantic Ocean in the west towards Hopefield in the east. The West Coast Gate in the south of the park is about 100km from Cape Town along the R27, 11km past the turnoff to Yzerfontein/Darling. You can also enter the park from the Langebaan Gate in the north, which you get to from Park Drive in the town of Langebaan. Gates open from 7:00 till 18:00 in April to August and from 7:00 till 19:00 in September to March. As a day visitor you can speed up the time you spend at the gate (especially in flower season in August and September) by downloading this registration and indemnity form to fill out and hand in at the gate when you arrive. And of course your entry is free if you have a Wild Card. Most roads in the park are tarred so visiting with a 2x4 sedan is a cinch. The last section of the road to Tsaarsbank and Postberg, as well as the roads in the Postberg section itself, are fairly good gravel. 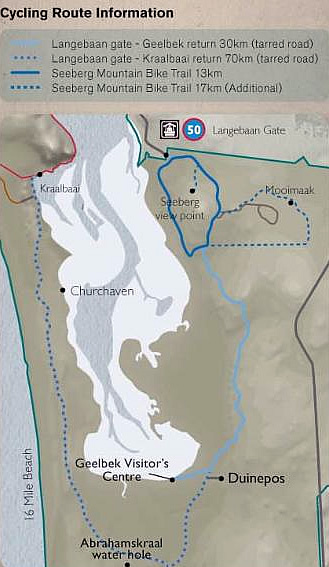 From West Coast Gate in the south to Langebaan Gate in the north is about 25km. Tsaarsbank and the entrance to the Postberg section of the park (open only in August and September) are about 25km from West Coast Gate, or 35km from Langebaan Gate. Geelbek Visitor Centre is about 10km from West Coast Gate or 13km from Langebaan Gate. Given that this is the West Coast, you have to accept that a lot depends on luck because there can be strong southerly winds in summer and northerly winds in winter. But strike a fairly wind-free day and you’re golden. An average of 265mm of rain falls in the park each year, mainly in winter. Semi-arid Mediterranean conditions mean temperatures are fairly mild – around 18 to 28 degrees Celsius in summer and 7 to 15 degrees Celsius in winter. Those pesky sea winds also help to cool things down in summer. Kingpin of the park is the Langebaan Lagoon, which is a Ramsar Wetland of international importance. The Postberg section is a riot of colourful spring flowers in August and September. There are 250 bird species in the greater park, or look for game species like eland and mountain zebra, as well as passing whales and dolphins along the Atlantic Ocean, especially from the Atlantic viewpoint or Tsaarsbank. Don’t miss the white beaches, turquoise waters of the lagoon on a sunny day or the replica of Eve’s 117 000-year-old footprints, which you can see at the Geelbek Visitor Centre. When planning your West Coast National Park accommodation you have a wide range to choose from. Duinepos and the Kraalbaai houseboats are both privately run, while the rest are run by and booked through SANParks. If the idea of living on the turquoise waters of the lagoon appeals to you, then you’ll love the Kraalbaai houseboats. Note, though, that they are anchored and you don’t get to drive them around. There are three houseboats to choose from, with a fourth to be launched in the second half of 2019. Larus has three cabins (six beds) and an open-plan equipped kitchen/dining area with braai, and a loo/shower. There’s a swim deck, deck under cover and power comes from gas and solar. Serenity has two cabins each with a double bed, and a double sleeper couch in the living room. There’s an equipped kitchen, living room with fireplace and large glass doors to invite the outside in, as well as a braai and dining table on the deck. There’s one loo/shower. Nirvana is the biggest, with an upper and lower deck. The lower deck has six cabins and three bathrooms, a shaded deck and floating platform for braaing, sunbathing and swimming. The upper deck has another three cabins (plus a double sleeper couch in the living room), a bathroom, and a living area and deck for lounging in the open air. The four- to six-bed self-catering chalets at Duinepos are among of the nicest places you can stay in this park. Painted in vibrant colours outside and with bright interiors, they cuddle up to the fynbos on the dunes. There’s an open-plan living area, well-equipped kitchen, two bedrooms and a loo/shower, with a small covered stoep that has a braai and picnic table. You have access to a communal braai area and swimming pool as well. It was originally a local empowerment project to bring skills and employment to the area, and now it’s run with friendly professionalism and eco-awareness. For more about Duinepos, read my post Duinepos chalets on the Cape West Coast. This self-catering cottage near the Abrahamskraal waterhole and bird hide has four beds and two single sleeper couches, equipped kitchen, living area with fireplace and two en suite bathrooms with loo and shower. There’s no electricity; it runs on gas and solar energy. You need to bring your own drinking water and firewood. There are two self-catering ‘beach cottages’ to choose from for your Churchhaven accommodation. Note, though, that they’re not in fact right on the beach, but on a rise about 150m away. They are also right next to each other, so don’t expect to have the area to yourself unless you’re booking both together. One has two bedrooms and four beds in total, equipped kitchen, living area and stoep with a view of the sea. There’s a loo and shower, but no electricity – everything runs off gas and solar energy. The other has three en suite (loo and shower) bedrooms and can sleep up to eight people. There’s an open-plan living area, equipped kitchen and a braai area outside. Runs on gas and solar power, no electricity or plug points so don’t bother bringing your hair dryer. This self-catering cottage has one bedroom with double bed and a double sleeper couch in the living room. There’s an equipped kitchen with stove, microwave and a fireplace. It’s next to the Geelbek education centre which hosts groups of school children so may be noisy; if you like quiet and privacy this may not be your best choice. This three-bedroom self-catering unit sleeps six (one double bed) but there’s only one bathroom with loo and shower, so it’s more suitable for a family than couples travelling together unless they don’t mind sharing a bathroom. Equipped kitchen with microwave, living area, stoep and braai. Like Steytler Cottage, it’s next to the Geelbek education centre which hosts groups of school children, so it may be noisy if there’s a school group visiting at the same time as you are. Manned visitor centre, restaurant and two bird hides at Geelbek, info panels about lagoon ecology, archaeology, butterflies, insects and mammals at Preekstoel, unmanned info centre at Seeberg view point where panels inside an old shepherd’s hut tell the history of the area. Bird hide near Seeberg view point and one at Abrahamskraal waterhole. Picnic and braai facilities at Tsaarsbank and Preekstoel. Nice beaches at Preekstoel/Kraalbaai. Note that there are no ATMs in the park and nowhere to buy firewood or charcoal; the nearest shops are at Langebaan. 1. Visit the Geelbek Visitor Centre to plan your days. You can find info here on birds and the bird hides in the park, browse posters of the plants and animals that occur in the park and see the replica of Eve’s footprint. Some 117 000 years old, it was discovered at Kraalbaai in 1995. The original is now preserved in the Iziko South African Museum in Cape Town. 2. Treat yourself to a meal at Geelbek restaurant next to the Geelbek Visitor Centre. Sit in the shade outside to enjoy traditional fare like bobotie, curries and bredies, as well as burgers or fish and chips, not to mention coffee and cake. 3. If you visit in August or September, you simply have to see the blaze of colourful spring flowers in the Postberg section of the park and the Seeberg/Mooimaak area. Postberg is closed during the rest of the year. Enjoy displays of daisies and bulbs, including suurvy, gousblom, vygie and white rain daisy. For more info on the spring flowers, photos and some tips on getting the best from your flower trip, read Spring flowers a Postberg on the West Coast. ​There’s also a one-night, two-day Postberg hiking trail during these months. It starts and finishes at Tsaarsbank and you carry your own tent to sleep overnight at Plankiesbaai. The first day is about 15km, the second about 12km. Bookings open in June, tel +27 (0)22 707-9902. Only 12 people are allowed on the trail at any time, so if you grab one of the spots you’ll be celebrating. 4. Go whale-watching between August and October, especially from the Atlantic view point and Tsaarsbank, both of which look out over the Atlantic Ocean. 5. Enjoy a game drive around the park. Although a hefty concentration of the park’s mammals are in the Postberg section (only open in flower season, see point 3 above), you’ll likely find eland, red hartebeest, springbok, bontebok, steenbok and mountain zebra in the rest of the park too. Other animals more rarely seen include caracal, bat-eared fox, African wild cat and honey badger. Stick to the speed limit and watch out for tortoises and snakes along the road so they don’t become roadkill. 6. Do you love bird-watching? You’re spoilt for choice here in the Ramsar Wetland with more than 250 species. There’s a great variety, from curlew sandpipers, flamingos and pelicans to black harriers and ospreys. September to March is the best season to see the migrants from Eurasia. In the fynbos you might spot southern black korhaan, ant-eating chat and Cape spurfowl. 7. Don’t miss spending time at some of the park’s four bird hides – two near Geelbek Visitor Centre, one at Abrahamskraal waterhole not far from the West Coast Gate in the south of the park, and one near the Seeberg view point in the north. The best time to watch waders in the lagoon is as the tide starts to come in, when rising water levels bring them closer and closer to the hide. 8. If plants get you excited, you don’t have to wait till spring to see them. In this park you can see more than 480 plant species, some 35 of them Red Data listed endangered species. Plants to look for include the candelabra flower, chinkerinchee, malva and rooinaeltjie. 9. If it’s clear blue waters and white beaches you’re looking for, head for Preekstoel and Kraalbaai to relax on the shores of the Langebaan Lagoon and feel the sand between your toes. ​10. Take a picnic basket or cooler box packed with meat and cool drinks and make a braai in one of the designated places at Tsaarsbank (with views of the Atlantic Ocean and perhaps some whales or dolphins) or Preekstoel (with views of the Langebaan Lagoon and houseboats resting serenely on the water). Note that alcohol is not allowed at these sites. 11. Unless you know a researcher and can wangle a special invite you won’t be allowed to visit the islands in Saldanha Bay – Marcus, Malgas, Jutten and Schaapen islands. But you should know that they’re managed by the West Coast National Park and are important breeding colonies for Cape gannets and other seabirds. For instance, about 30% of the world population of African black oystercatchers breeds on these islands, as do endangered bank cormorants, kelp gulls and Cape fur seals. 13. If you’re keen on fishing or water sports, make sure you know where you’re allowed to carry out these activities in the Marine Protected Areas (MPAs) of the Langebaan Lagoon, which is divided into three zones. They're clearly marked on the map you'll get at the entrance gate. Zone C around Geelbek in the south of the lagoon is demarcated as sanctuary, so no water sports or fishing are allowed. Zone B from south of Churchhaven to just south of Kraalbaai in the west and the Seeberg bird hide in the east is designated a restricted zone; only sail boats and board sailing is allowed, no power boats or angling. Zone A from Kraalbaai north towards Saldanha Bay is a multi-functional section where water sports like kite surfing, waterskiing, snorkelling, diving, kayaking, swimming, fishing, angling and boating are allowed. ​If you’re not sure, check at the Geelbek Visitor Centre or contact the park directly before your visit, tel +27 (0) 22 772-2144/5. Also, even in Zone A, don’t go fishing or angling without the necessary licence/permit. 14. Go walking along one of the short hiking trails in the park. The Bakoor Trail from Langebaan Gate to the Seeberg view point is 4.6km. There are also two circular walks from Geelbek. One is 7km (with an option of a longer 14km route), the other 9km (also with a longer 14km option). You can pick up basic maps for these from the Geelbek Visitor Centre. You need to book ahead for the 13.9km one-day Steenbok Trail that starts and ends at Tsaarsbank and is only open in August and September. 15. For a more immersive experience, hike one of the longer, multi-day trails in the park. Choose from the two-day 28km Strandveld Trail that takes you through West Coast Strandveld vegetation and to Sixteen Mile Beach before returning to Geelbek. The two-day Postberg Trail opens in August and September (see point 3 above for more info). Or opt for the two-and-a-half-day guided Eve’s Trail that’s privately run by Cape West Coast Biosphere Trails. The slack-packing trail is named after the 117 000-year-old footprint of Eve – the person from whom experts think all human life descended. This three-stage hike across Strandveld and beach offers views of the ocean and lagoon as you trace Eve’s footsteps. You’ll carry a day pack, but lifts are organised and your luggage is delivered to the next stop. Enjoy traditional West Coast food cooked with love by locals. 16. Go cycling or mountain biking among the Strandveld fynbos with wonderful views all around. Two cycling routes follow tarred roads from Langebaan Gate; choose from a 30km trip to Geelbek and back, or a 70km outride all the way to Kraalbaai and back. There are also two trails for mountain bikers. The 13km Green Trail starts at Langebaan Gate and sets off along gravel paths to the Seeberg bird hide before looping back to the gate. The 17km Red Trail also starts at Langebaan Gate and follows the same route as the Green Trail but then climbs up to the Seeberg view point and to Mooimark before heading back towards the gate. See a basic cycling/mtb route map here or pick up a West Coast National Park map showing the routes when you enter the park at either of the gates. Hi Roxanne! Thank you for sharing your experience. It's the first time I read a blog from you and honestly, I'm kind of hooked already. I'm a bit conscious with budget when I travel. Are there camping options for accommodation? like a public campsite? Thanks for your comment, Jake. There is no campsite inside the park, which is strange because most SANParks parks do have camping facilities. But you can try the campsite in Langebaan (http://www.sbm.gov.za/pages/resorts/Oostewaal/oostewal.html) or Yzerfontein (http://www.swartland.org.za/pages/english/yzerfontein-caravan-park.php). Thanks, Stuart, always glad to inspire others to get out into nature.